The Hartford HealthCare Center for Surgical and Medical Weight Loss offers a new approach to weight loss, vBloc® Neurometabolic Therapy. Drs. Pavlos Papasavas and Darren Tishler of Hartford Hospital are among the nation's first surgeons trained to offer vBloc® vagal nerve therapy since it was approved by the Food and Drug Administration (FDA). This innovative, new weight loss therapy relies on a pacemaker-type device that blocks hunger signals between the brain and stomach, allowing you to feel fuller longer and reducing the amount of food you want to eat. Studies have shown that patients who use vBloc® Therapy lost an average of 28% of their excess weight in one year when vBloc® was active for 12 hours per day. A feasibility study showed that 85% of vBloc® patients were able to maintain, decrease or discontinue their diabetes medication as well as achieving improved glycemic control after one year. vBloc® patients have also shown improvement of LDL cholesterol levels, have lowered their triglycerides, blood pressure, and heart rate, and have reduced their waist circumference. vBloc® Therapy is a neurometabolic (a metabolic effect on the nervous system) therapy delivered through a device called the Maestro System. This device is implanted under the skin. 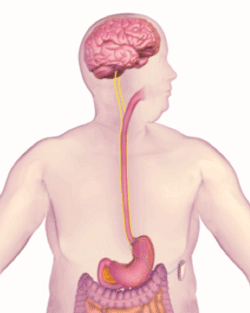 The two device wires are connected to the vagus nerve, which sends signals between the brain and stomach to control the sensation of hunger. The device is programmed to deliver therapy for at least 12 hours each day, while patients are awake. Adjustments to programming should be expected to optimize therapy. Patients will need to routinely charge and manage the battery life of the Maestro System. Who is a Candidate for vBloc® Therapy? Individuals who have a body mass index (BMI) between 40 and 45 may be qualified to receive vBloc® Therapy. You may also be qualified if you have tried to lose weight through a supervised diet and exercise program in the last five years, and have a BMI between 35 to 39.9 along with a health-related condition such as type 2 diabetes, sleep apnea, high blood pressure, or high cholesterol. 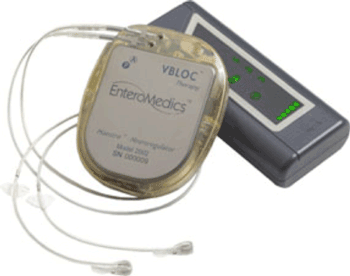 vBloc® Therapy is not recommended for individuals who have: cirrhosis or high blood pressure in the veins of the liver, enlarged veins in the esophagus or a significant hiatal hernia of the stomach; need magnetic resonance imaging or a diathermy procedure using heat; are at high risk for surgery; or have an implanted electronic device. vBloc® Therapy has been shown to have a lower complication rate than traditional weight loss device procedures. No alteration to the stomach or digestive track. On average, people who received vBloc® Therapy as prescribed, lost 28% of their excess weight, in one year. Enables you to adapt health eating habits without eliminating food groups or types. Postoperatively, patients must remember to charge their Maestro system and follow the instructions of their health care provider. Possible side effects include discomfort at the Maestro System implantation site, and heartburn. Characteristically, weight loss procedures create a sense of fullness. Small amount of bulk type food may alleviate sense of hunger. It may be less effective for high calorie drinks and sugar-fat laden dessert. The Maestro System can be deactivated or reactivated for an emergency or pregnancy. The device can also be removed.